June 29th is National Waffle Iron Day, and who am I to ignore a holiday? I’ll be whipping up these Breakfast Poutine Waffles on the 29th, and I thought I’d share the recipe with all of you so that you can do the same. 🙂 Today’s post also includes some wonderful sweet and savory waffle recipes from the wonderful group of tastemakers from the Sunday Supper Movement. So, be sure to scroll all the way to the bottom of the post, you’ll be glad that you did. Have I mentioned before that I love waffles? No? Okay: I love waffles. I love them with maple syrup (Obviously. I’m Canadian… maple syrup runs through my veins), I love them with jam, with jelly, with marmalade, I especially love them with lots and lots of fresh fruits … I even love them plain! What’s not to love about these Light Fluffy Crispy Buttermilk Waffles, for example? Yum! During PoutineFest, a summertime festival in Montreal, restaurants, food trucks, and the like put together unique combinations of poutine. 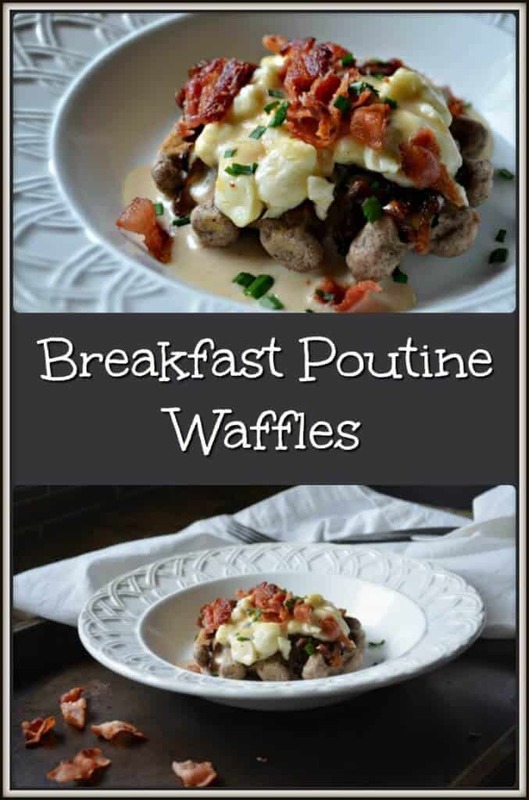 I thought this recipe for Breakfast Poutine Waffles was the best of both worlds! My Breakfast Poutine Waffles vary from the traditional poutine in a few ways. For starters, I didn’t use fries, or potatoes at all – I used a buckwheat waffle as my base, instead. Waffles are naturally pretty sweet, even when they are enjoyed plain, but buckwheat waffles have a rich nutty flavor – makes them perfect for this dish! A good poutine traditionally calls for cheese curds, which must always be squeaky. In fact, the squeakiness ensures freshness. Cheese curds can be kept at room temperature for a period of 24 hours post manufacturing date. After the 24 hours, the curds need to be refrigerated. In Quebec, fresh cheese curds are easily available. To be honest, I can’t quite imagine poutine without the cheese curds, so this recipe for Breakfast Poutine Waffles holds on to them. My daughter tells me that she still remembers the first time she tried a poutine, ever. It was around the time when my son had gotten his first job, and had some spending money for the first time ever. One day, he came home with a poutine for himself, because he had “always wanted to try it”. He let my daughter sample some. Both of them agreed that they didn’t much like it, but my daughter has since eaten her words (she’s also eaten much, much more poutine since then. Haha.) 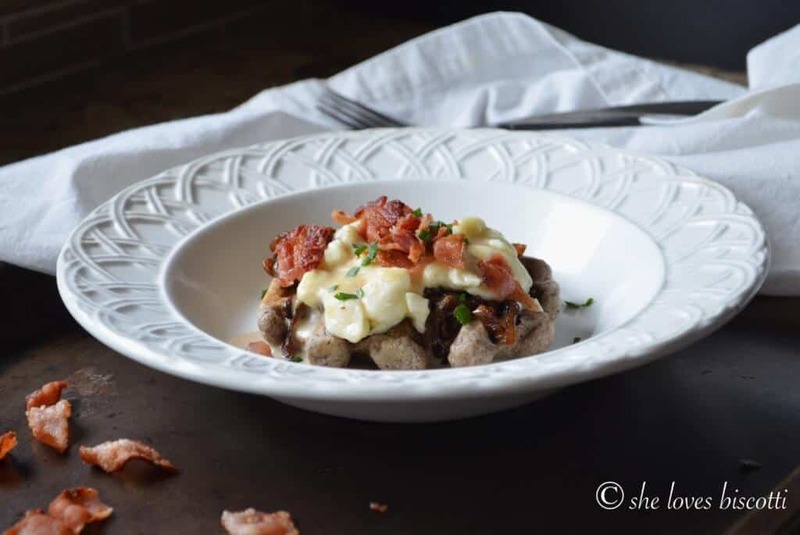 This recipe was her idea, and I decided to go with it – I thought it would be a fun project for the two of us, and a great way to celebrate PoutineFest, National Waffle Iron Day and the Sunday Supper theme in our own way. 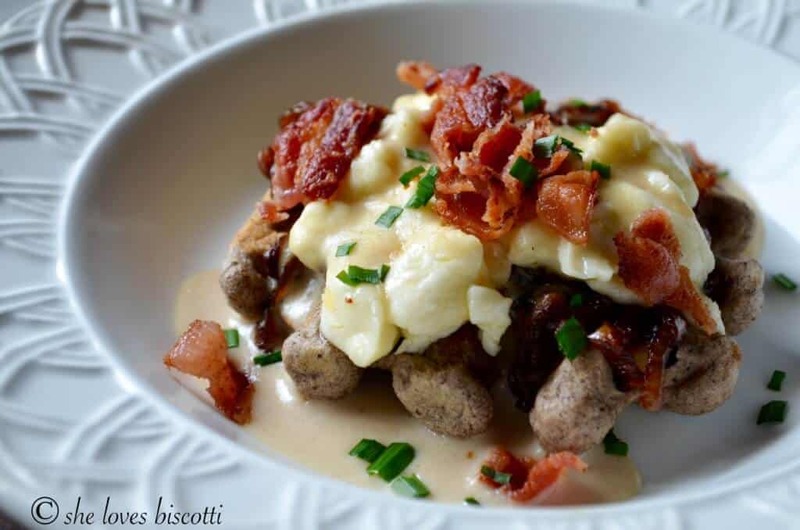 Be creative with this recipe for Breakfast Poutine Waffles! Let me know what kind of combinations you try, and how well you like them. June 29th is National Waffle Iron Day, and who am I to ignore a holiday? 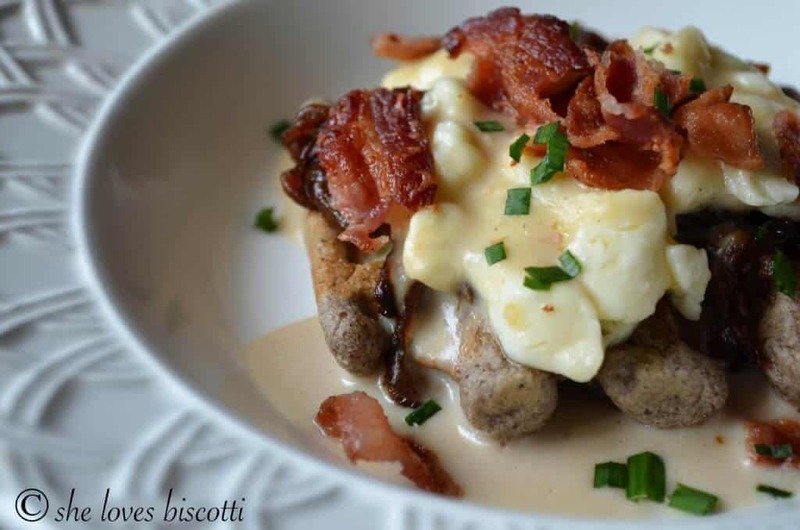 Celebrate by making this recipe for Breakfast Poutine Waffles. In a large mixing bowl, whisk together dry ingredients. Set aside. In another bowl, whisk together oil, buttermilk,and vanilla. Gently combine with dry mixture. Pour about ¼ - ⅓ cup for each waffle. (I use a large serving ladle and drop the batter in the middle of the waffle iron). Remove the skins from the onion. Cut in half and slice thinly. Heal olive oil in a frying pan over low heat. Stir. Make sure onions are completely coated with the oil. Add a pinch of salt and continue to cook slowly for another 20 - 30 minutes. All the while, keep stirring. Once the onions are a deep golden color, deglaze the pan with wine. Heat butter in a frying pan over medium heat. Continue to whisk until golden brown. Whisk in the milk and return pan to the heat. Cover and keep warm until ready to use. Place waffle on your plate. Top with carmelized onions, cheese curds and creamy gravy. Optional: Garnish with bacon and chives. Every Sunday, there is a wonderful group of bloggers called the #SundaySupper tastemakers that collaborate together on a theme. As was mentioned, today’s theme was Waffles and I think you’ll agree the line-up of recipes is totally amazing! I would like to thank the event host for this event Sue Lau from A Palatable Pastime. Thank you Sue! Excellent choice to add those caramelized onions (and bacon, of course)! This sounds, and looks amazing. And, thanks for sharing about the Hollandaise sauce. Sometimes I think I’m the only one with fails in the kitchen. I like everything to work the first time. Hollandaise can be tricky. I used to have to make it to serve 60 people and hold it for the 5 hours during service at a restaurant. But, oh how I love it. Thanks for this fabulous recipe. That sounds amazing! Of course cheese curds and cream sauce could make anything amazing, but those waffles and caramelized onions are not a bad way to start! Because what is a poutine without waffles! Nice! Great idea. lol …thanks Meaghan … enjoy 🙂 Thanks for dropping by! I didn’t think anything could be better than fries and then you made these waffles. So fun and yummy. 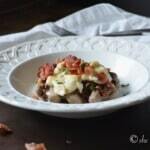 Yes, please to cheese curds, cream sauce and bacon! I am even a huge fan of buckwheat. Lovely dish, Maria! YUM! I’ll take mine with bacon, please! !